When I began this project, I told myself that I would avoid giving a synopsis of every book I read. I don’t need to reproduce something that is already available on the interweb. Instead I try to write about topics that are less frequently discussed, to get below the surface. So far, I think I’ve probably failed at both of these goals. I promise I’ll try harder. In any case, because I’ve focused on issues or topics that are mostly overlooked, you might have a wildly different opinion of some of these books than I have. When you do, I want to hear about it. In this week’s book, there is really only one topic that I want to bring up and unfortunately any discussion of it will necessitate giving away the ending. Though I will do my best to artfully dance around giving out too many details, if this is one you want to read, skip to the bottom for my recommendation. It makes no sense that this book was so good. The premise of this book has been done so many times, though this book predates all the iterations I’m aware of. The basic idea is pretty identifiable; a politician goes missing at a critical juncture his campaign. The closest confidants of said politician find an uncanny replacement who ends up doing an amazing job of impersonating the politician and fools everyone. I’ve never really cared much for this story before, but there were some differences this time. First, this story really reminded me of Mad Men. ‘Nuff said. ‘Nuff. Early in the book, as Lorenzo (the main character and impersonator) describes his father, he describes him as a severe man who was a stern teacher of the dramatic arts. References to his father are peppered throughout the rest of the book. In the beginning he mentions in passing that his father was not very forgiving or complimentary but it is clear that most of his attitudes, opinions and decisions are informed by his father’s influence. In each instance though, reference to his father usually just serves to give context to something he’s done and never gives the feeling that there is anything deeper going on. At first, Lorenzo resents having taken the job. As the book progresses though, he finds himself falling into his role, even when he had no need to be in character. Then toward the end, after he had come to believe in what he was doing, he is given the opportunity to visit the man he is impersonating (John Joseph Bonforte) and refuses. He justifies himself by saying that he didn’t want his only memory of the man to be one of a weak, sick old man when he was supposed to think of him as a powerful political figure. He goes on to explain that this is the very reason he didn’t attend his Father’s funeral; he didn’t want his memory of his father to be that of a corpse. His excuse is believable though so I was still caught off guard (so was Lorenzo) when Lorenzo finally does meet the ‘real’ Bonforte at the party following their political campaign. Bonforte looked exactly like Lorenzo’s father! Bonforte though is kind, gentle and is genuinely stunned by the quality of Lorenzo’s “performance.” When Lorenzo is shortly thereafter asked to remain in his role for the rest of his life, he immediately answers negatively, but in Bonforte’s voice. Wow. There was no internal discussion about Lorenzo having some realization about his father or his childhood or anything, it was just there for people to pick up on it or miss it entirely. The most forthright discussion of the topic Lorenzo has came in his concluding remarks and they represent the reflection of a tired man who has spent his life pretending to be someone else. This was easily the saddest (or happiest, I suppose) moment as well as the most emotionally subtle and complex part of the book. I love when an author pulls off subtlety so it was pretty much speaking directly to me. I finished the book with a smile. 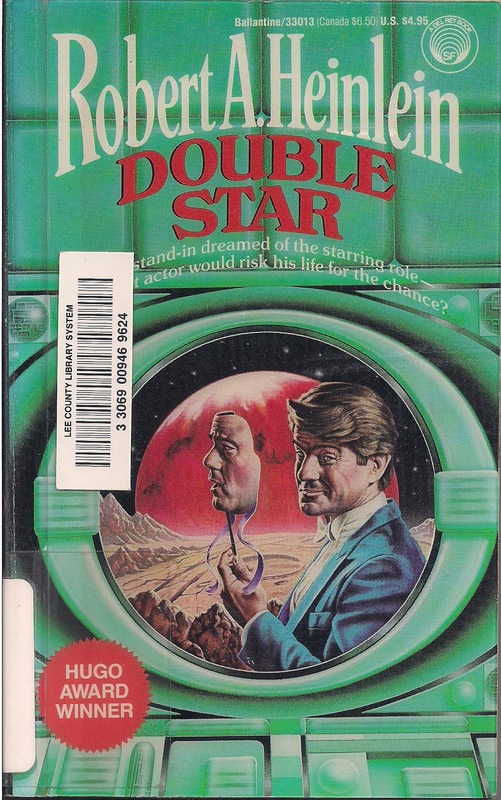 Double star is really amazing for its ability to deal with an issue that is done often and often done poorly. Even for Heinlein, it is pretty uncommon to not be force-fed whatever he feels is the moral of the story. For the most part, I think the book is just a short and fun book to read. I enjoyed it quite a bit and finished it pretty quickly too, but it was also, for everything that was good about it, exceedingly forgettable. This week’s book is The Demolished Man by Alfred Bester. I know nothing about it and I’ve never read anything by this author so it should be fun. Next week’s book is Farenheit 451 by Ray Bradbury. This time it is definitely not a false alarm. I’m actually going to be reading it next week. This will be my first re-reading and I’m not sure if that will work in the book’s favor or not. Just wanted to say those are GREAT goals you mention at the beginning. So many reviews are just synopses...I love reviews that look at more unusual aspects.